Amid concerns of South Korea’s auto industry losing competitiveness due to high labor cost and low efficiency, Hyundai Motor and the Gwangju Metropolitan City Government have begun discussing a joint factory in Gwangju. 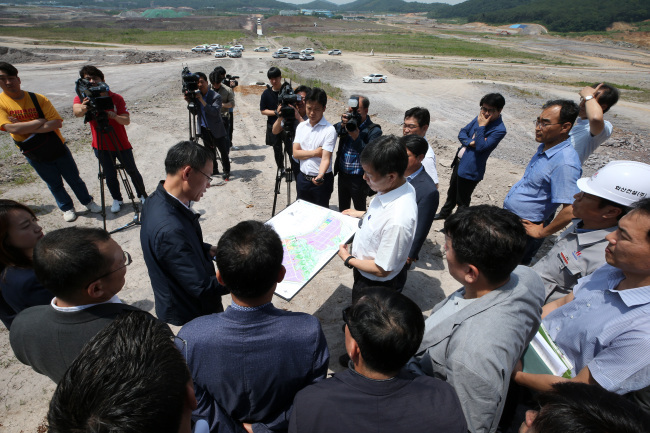 Nine Hyundai working-level officials visited Gwangju earlier this week to inspect the site of the factory that is expected to complete construction by 2020. When built, it would create over 12,000 new jobs in the city, while lowering production cost for automakers by lowering wages. It would be Hyundai’s first factory for finished cars to be built in the country in 22 years. Hyundai Motor is expected to invest about 55 billion won ($51.3 million) in the 700 billion-won project, while the Gwangju government will invest some 560 billion won through investors and loans. As the largest shareholder, the government would be responsible for the overall management of the plant, where cars will be manufactured for multiple automakers upon orders. The Gwangju government is currently looking for additional investors and automakers besides Hyundai Motor to set up a joint venture. “The Gwangju government has put together a very smart, rational business model that reduces production costs and risks automakers have to bear when building new factories, while boosting job opportunities in the region,” said Lee Ho-geun, a professor of automotive engineering at Daeduk University. The company’s latest initiative, however, has also met the usual roadblock of its staunch union, which has taken issue with the initiative, citing fears that it might lower the level of Hyundai laborers’ average pay. With Gwangju’s incentives, the average annual wage of workers at the new plant would be around 40 million won ($37,442), approximately half the wage Hyundai’s workers at Ulsan, Asan, and Jeonju plants currently receive. Calling the plan “politically influenced,” the union said that existing production capabilities are sufficient to meet demand. Another issue at hand is the arrangement with the labor union that vehicles produced at Hyundai’s plants cannot be transferred for production to another plant without approval from the union. Therefore, only a new model can be produced at the plant. Government officials said, there is a high possibility that a compact sport utility vehicle model would be produced at the new plant with the capacity to produce 100,000 units annually. Hyundai’s five factories in Ulsan, North Gyeongsang Province, have the capacity to manufacture a total of 1.4 million units annually. Its factory in Asan, South Chungcheong Province, and one in Jeonju, North Jeolla Province, has annual production capacity of 260,000 units and 60,000 units respectively. Due to high labor cost and low efficiency, Korea was the only country that saw a drop in the total number of vehicles produced for two consecutive years last year, according to the Korea Automobile Manufacturers Association. A total of 4.1 million units were produced here in 2017, down 2.7 percent on-year.